Born in El Paso in 1937, Celia Alvarez Muñoz grew up amid competing cultures, languages, and value systems along the U.S.-Mexico border. In this in-depth study, Roberto Tejada gives an account of the artist through biography and cultural history, in conjunction with more traditional art history and close visual analysis. As both poet and photography historian, Tejada offers a critical corollary to Alvarez Muñoz’s artistic practice: while the poet engages the arbitrariness of language, the photography historian engages the indexical nature of the image. In straddling these modes, Celia Alvarez Muñoz introduces us to an image-text artist whose art explores the first glances and misread signs that occur where cultures meet and the stories that they tell about the history of American society, culture, and modern art. 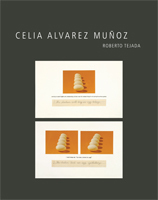 "Celia Alvarez Muñoz is an elegantly written study that situates the author's work in relation to Chicana/o cultural history as well as to (post)minimalist and (post)conceptualist art.... It lays a foundation for rethinking the canon in a way that bridges the gap between Latin American studies and U.S. art criticism." "Tejada effectively demonstrates how Alvarez Muñoz’s critical dialogue with mainstream art and its institutions exposes 'features of a culture often neglected by histories of art founded only on aesthetic form." "Celia Alvarez Muñoz makes a significant contribution to art history, exploring the artist’s highly complex verbal/visual process of weaving together U.S.-Mexico history and contemporary art practices.... This book is an impressive addition to the growing body of scholarship on Latino artists and will serve as a cornerstone for a wide range of courses on art history, Chicano studies, and women’s studies."